Hebeloma insigne is an aspen-associated, Rocky Mountain species that is similar to Hebeloma sinapizans; it is bulky and features a scaly stem surface. However, in the early stages of development it also features an ephemeral cortina, and it lacks the radishlike odor and taste of Hebeloma sinapizans. 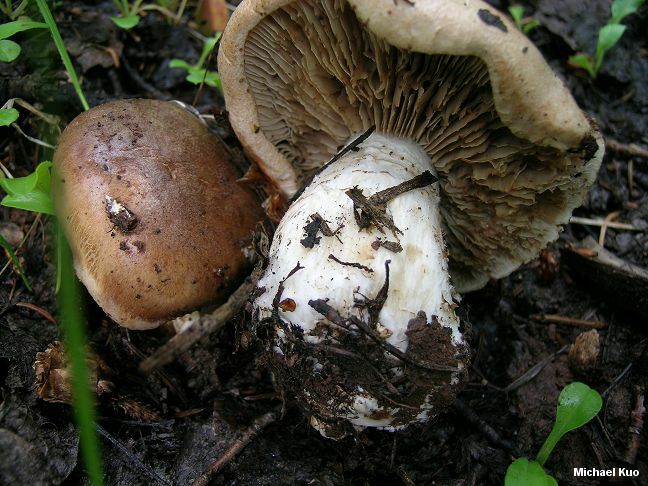 Ecology: Mycorrhizal with aspen, but often found in mixed conifer-aspen forests, leading to confusion in documentation; usually growing gregariously; late summer and early fall (monsoon season); Rocky Mountains. Cap: 5-10 cm; convex, becoming broadly convex or nearly flat; sticky when fresh; bald; with a soft, cottony margin when young; cinnamon tan to pinkish brown; the young margin adorned with fibers from the ephemeral cortina. 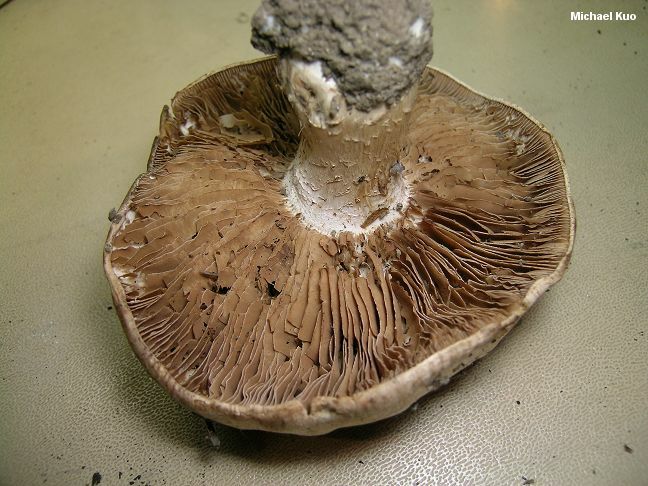 Stem: 4-8 cm long; 1-3 cm thick; more or less equal above a swollen base; developing scales, often in more or less concentric bands; whitish, but the scales often capturing spores as the mushroom matures and thus becoming brownish. Odor and Taste: Odor pungent, or not distinctive; taste mild. Chemical Reactions: KOH negative on flesh. Iron salts slowly gray on base of stem. 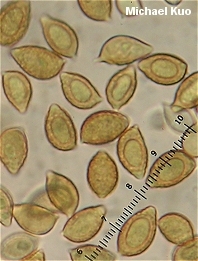 Microscopic Features: Spores 11-15 x 6-8 µ; sublimoniform; finely verrucose; moderately dextrinoid. 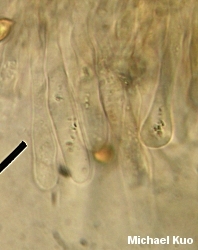 Cheilocystidia 50-70 x 7-9 µ; abundant; subclavate to clavate. 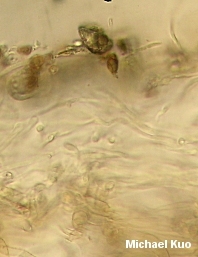 Pileipellis an ixotrichoderm in young specimens; later an ixocutis. REFERENCES: A. H. Smith, V. S. Evenson & D. H. Mitchel, 1983. (States, 1990; Evenson, 1997; Miller & Miller, 2006.) Herb. Kuo 08120703. 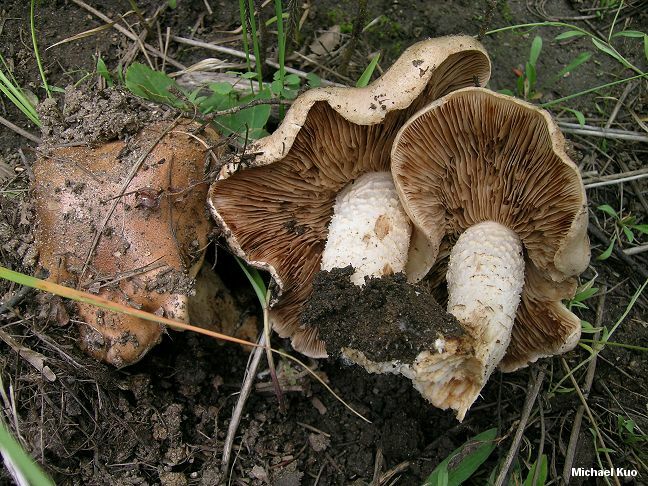 Although Hebeloma insigne is currently known only from the Rockies, collections of "Hebeloma sinapizans" from northern and montane ecosystems in which aspen predominates may need to be reconsidered.